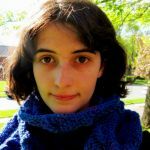 On this page, let Anna Snyder introduce you to CuChulainn- one of ancient Ireland's most famous heroes and the tales that evolve around him. 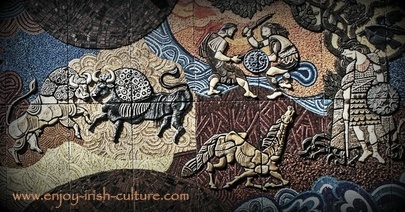 CuChulainn and the Ulster Cycle celebrated in a Desmond Kinney mural off Nassau Street in Dublin, Ireland. Scenes depicted from left to right: the fight of the prize bulls, our hero fighting his foster brother Ferdia, and on the far right tied to a tree to die with a raven on his shoulder. 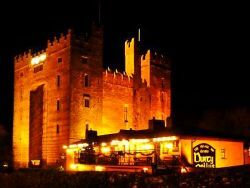 Ireland, a nation famed for its storytelling prowess, has produced generations of world famous writers, poets, and playwrights. Masterpieces from James Joyce’s Ulysses to the poetry of Seamus Heaney have revolutionized the literary world, and Ireland’s unique way with words draws from thousands of years of an oral tradition of folklore and epic poems. These tales still have strong influence over the culture of modern Ireland, and none so much as the series of heroic myths, “The Ulster Cycle” which features one of ancient Ireland's best known heroes. The earliest written form of the Ulster stories dates back to the 12th century AD, written by medieval monks in the Book of the Dun Cow. However, the language in the manuscript dates back to the 8th century, and the stories are thought to be much older. They tell of a prehistoric Celtic society of warriors, chieftains, druids, kings, queens, and poets, very similar to the continental La Tène society of the late Iron Age. The Táin Bó Cuailnge, a poetic retelling of the Cattle Raid of Cooley that led to war between the provinces of Ulster and Connacht, makes up the heart of the Ulster Cycle. But a series of remscéla, or pre-tales, gives us a closer look at the characters and the world they live in. 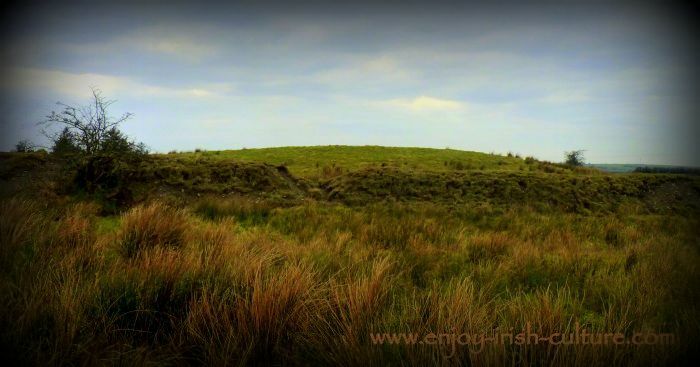 The location of the mythical battle between two prize bulls described in the Tain was at Rathnadarve fort at Rathcroghan, County Roscommon, Ireland, depicted here, which is considered by archaeologists to have been the residence of a Celtic royal family. With the god Lug mac Ethnenn as his father, CuChulainn possesses superhuman strength and agility, and much of the Ulster Cycle is dedicated to chronicling his conception, life, and death. The Ulster Cycle depicts a heroic era, viewed by the medieval monks who recorded it as Ireland’s golden age, in which honor, violence, and wit are of utmost importance. Our warror hero represents the poetic ideal of all of the virtues of the age, being young, handsome, virile, witty, honor-driven, and prone to the “Warp Spasm,” a berserker rage where he slaughters anyone who gets in his way—a warrior-poet in the classic sense. Even as a child he was ferocious. When invited to Culann's fort and attacked by his guard dog, he killed the dog by smashing a hurling ball through its teeth. His exaggerated sense of honor then bound him to the service of Culann as a replacement attack dog, earning him the name CuChulainn, or “Hound of Culann” which from then on, age seven, replaced his birth name 'Setanta'. 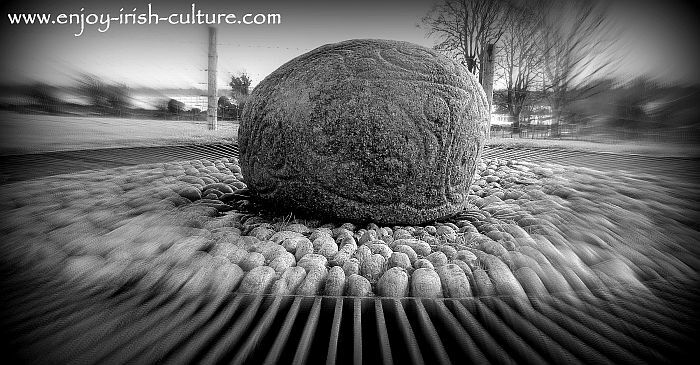 One of the few artifacts of ancient Celtic society in Ireland- the Castlestrange stone in County Roscommon, Ireland. In many cases, the characters of the Ulster Cycle are so preoccupied with honor and glory that they forget to bother with human compassion, a flaw inherent in their society that ultimately leads to its downfall. The scene is set at the very beginning of the tales, when a rich landlord forces his pregnant wife, a supernatural being named Macha, to race a chariot just so he can make good on his boasting. With her dying breath, she curses all the warriors of Ulster to suffer with a woman’s birth pangs during their time of greatest need, which comes back to haunt them throughout the cycle of stories. In the tale of Deirdru of the Sorrows, Conchobar orders the deaths of three of his greatest warriors and many more besides, because he thinks that as king he has the right to marry Deirdru, the most beautiful woman in Ireland. Deirdru, who has other plans, runs off with Noisiu mac Uislenn and his brothers, and when Conchobar has them betrayed and murdered, she kills herself. Even the women of Ulster revel in bloodlust. When CuChulainn is courting his future wife, Emer, she refuses to marry him until he has proven his worth as a warrior by killing multiple hundreds of soldiers. But feats of carnage are not the only means by which Emer sizes up her suitor; they speak to each other in flirtatious riddles that go over the heads of her ladies in waiting, proving CuChulainn is a poet as well as a fighter. It is at Emer’s urging that he travels abroad to complete his training with Scáthach, a warrior prophetess, developing his value as a warrior beyond solely his killing abilities. The story Bricriu’s Feast shows the more comical side of the Ulster Cycle, in which our hero and two other warriors travel all across Ireland, engaging in contests and trials each to prove that he deserves the select Champion’s portion of meat—at last our hero forfeits, understanding that the prize is not worth the trouble. The tragic aspect of this warrior mindset is evident in the story 'The Death of Aoife’s One Son', in which CuChulainn’s son by another woman warrior who trained him comes to challenge the men of Ulster. Despite his wife's pleas not to, our hero kills his own son, thus depriving Ulster of the greatest warrior it would have ever known. Perhaps the most heartrending and absurd story in the Ulster Cycle is that of our warrior hero killing his foster-brother, Ferdia, in combat. Even while Ferdia, who studied martial arts under Scáthach with him, is the person he loves most in the world, both warriors set out to kill each other out of a sense of duty to their opposing monarchs. After three days of furious battle and three nights of tending each other’s wounds, our hero finally kills Ferdia with his signature weapon, the gae bolga, and delivers many grief-stricken laments afterwards. In the end however, even CuChulainn himself is doomed by his own pride and overwrought notion of honor. When Ulster’s armies are suffering from their age-old curse, a sorceress goads him into leaving the safety of the fortress at Emain Macha to fight Connacht’s forces singlehandedly. On the road to battle, CuChulainn comes across three crones—in truth they were the Morrigan, goddess of war and death, disguise—who shame him into eating a roasted dog, a taboo being as the hound is his spirit animal. As soon as he does this, half of his body withers away. Later, at the threat of being satirized by three druids he meets, he kills them with his three spears, which are then stolen and used to deal him his death blow. 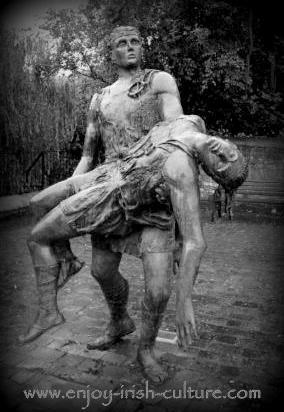 As CuChulainn dies—famously represented in the bronze statue in the General Post Office in Dublin—he ties himself to a stone so as to remain standing. Even then his enemies are too afraid to approach until they see a raven land on his shoulder, signifying that he’s finally dead. While these stories are thousands of years old, they remain popular and influential among the Irish, with every generation of children growing up hearing them from their parents. CuChulainn and other prominent characters from the Ulster Cycle have inspired countless works of art in contemporary Ireland. They were especially popular during the Irish Literary Revival of the early 20th century, with writers such as Lady Gregory and William Butler Yeats preserving the old legends in poetry, plays, and collections of folklore. The Ulster stories were a common theme running through Frank McCourt’s memoirs, Angela’s Ashes, symbolizing an innocence and simplicity he could never return to, just as Ireland will never revert to its wild, pagan days of warring clans isolated from the rest of the continent. Even today, CuChulainn is a common subject in songs, stories, graphic novels, and videogames, a testament to the endurance of a good story.